Coronary computed tomography angiography is a reliable tool to assess long-term cardiovascular risk in suspected CCS. A recent study in JACC: Cardiovascular Imaging suggests that coronary computed tomography angiography (CCTA) has a role in patient risk stratification, which allows for demarcation of separating prognostic groups and was effective in reclassifying two-thirds of this study population within clinical risk groups. This observational study sought to validate the negative predictive value of CCTA. It also sought to determine the incremental predictive value of different CCTA parameters in risk prediction in comparison with the standard clinical risk assessment. This study included inpatients and outpatients with undiagnosed coronary artery disease (CAD) undergoing CCTA over a 4-year period. The study investigated laboratory results for a variety of factors including cardiac risk factors, health, and demographic data. The researchers calculated a MORISE-score (which evaluates both risk factors and clinical symptoms to determine cardiac risk). Participants underwent cardiac segmentation and were sent follow-up questionnaires. The primary endpoint of this study was a composite of death or non-fatal myocardial infarction. The researchers showed that of the eligible participants (N=2099), 2011 participants were able to be contacted for follow-up at 10 years (96% rate). The demographics of the follow-up population were the mean age of 59±11 years, 1328 males, and 20% low, 74% moderate, and 6% high MORISE-scores. There were cardiac deaths (n=42) and non-fatal myocardial infarctions (n=16) reported. The authors noted the “MORISE-score had a decent discriminatory ability for composite endpoints with a c-index of 0.622”. 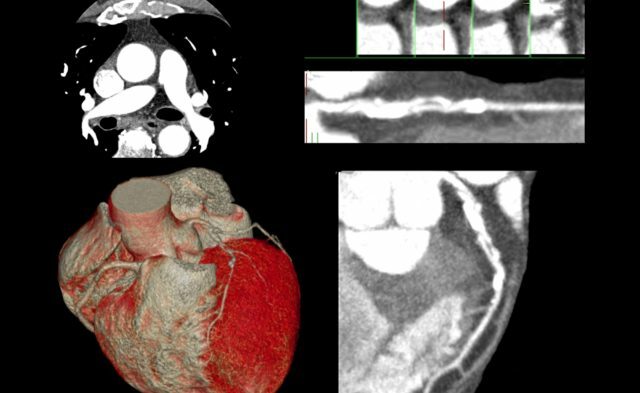 Computed tomography results showed participants with normal coronaries (n=570), non-obstructive coronary stenosis (n=897) and obstructive CAD (n=544). The authors noted that the event-free survival period for participants with normal arteries reached full observation length of 10 years independent of various factors in contrast with participants with obstructive or non-obstructive stenosis, which was 2.2 years. The MORISE-score clinical risk assessment classified participants as low-risk (20%), intermediate-risk (74%), or high-risk (6%) vs CAD (CCTA) severity classification (low-risk (83%), intermediate-risk (15%) and high-risk (2%)). The observational study design and low number of events were study limitations. Taken together, the researchers suggest that risk stratification according to CCTA results allows for demarcation of separating prognostic groups and was effective in reclassifying 75% of this study population within clinical risk groups.